Huge waves pounded the drenched coastal roads leading to Guimbal town in Iloilo where representatives from GK and LBF were set to hold a 3-day team-building workshop. Braving through this rough weather was a badge of commitment worn proudly by the GK full-time workers — a badge that would pale in comparison to that worn by Cora Fernandez, one of LBF’s staff who chose to attend the whole event even if her mother’s wake had only begun. When asked why, her trite and powerful reply was “mas madaming mawawala sa akin kung hindi ako umattend nito.” (I would miss out on so much more if I don’t attend this). This outpouring of great love and commitment for the mission has been the hallmark of the partnership between Gawad Kalinga and Lifebank Foundation. This kind of solidarity in spirit could not have been foreseen when the partnership started in 2010. All that was in the horizon were the 18 communities LBF supported through their Visionary Corporate Responsibility Program. But as soon as the programs for these communities were implemented something new began emerging. The unique values that animated the relationship of GK residents and volunteers captured the curiosity of LBF’s leadership. This paved the way for the evolution of a values formation program for LBF members and staff. One with GK in the vision to end poverty, LBF members and staff respond to the challenge of caring and sharing, starting with the poor in their hometowns. What started out as experiments in Iloilo and Antipolo in 2011 soon gained enough steam to become a nationwide pilot for 42,000 members and 300 staff of LBF — which is but a fraction of their 350,000 membership base that is run by a 2,000-strong staff complement. The initial sessions bore witness to the awakening of dormant generosity of LBF members and staff who responded to the challenge of caring and sharing, specially to the poor within their hometowns. 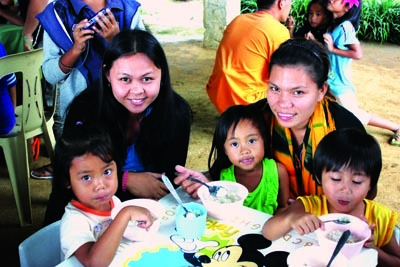 In Antipolo City, they fed the street children in their barangay. In Quezon City, they built homes in NTC GK village. 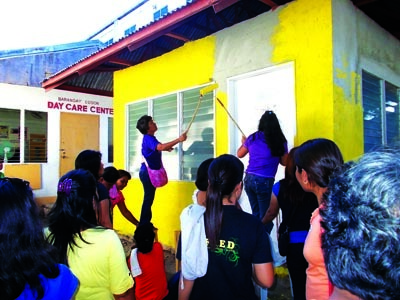 In San Carlos City, they repainted a public school. Everywhere these activities transpired, it revealed the untapped potential of the LBF members and staff to become a force of change and transformation. Today, as GK and LBF pursue the roll-out of the values formation program, preparations are also in full swing for a social enterprise program that seeks to lay the grounds for bayanihan economics. It is certain that this partnership will continue to evolve and give birth to even bolder initiatives. Emboldened by their love and commitment to the mission, LBF members and staff paint homes for the poor. On their own, GK and LBF are both consumed by a relentless passion for the mission of breaking the chains of poverty. In joining hands, they have only grown more emboldened because of the unique strength and confidence that comes from teamwork built on solidarity of spirit. From this place of deep unity, both groups anchor on the conviction that only in working together can we truly stand a chance at ending poverty. "Anchored on One Vision (GK and LBF: Emboldened by a Combined Strength)" was featured on Page 31 of THE COURAGE TO CARE: GK Annual Report (January 2011 - June 2012). You can download the full report here. Gawad Kalinga (GK) is too big a story for one person to tell, and it wouldn’t be complete without the partners who have been with us throughout the years. You too can be part of this mission of breaking the chains of poverty. For the different ways to partner with GK, click here.